Points are made on every serve for wining team of rally (rally-point scoring). Ball may be played off the net during a volley and on a serve. A ball hitting a boundary line is in. A ball is out if it hits an antennae, the floor completely outside the court, any of the net or cables outside the antennae, the referee stand or pole, the ceiling above a non-playable area. It is legal to contact the ball with any part of a player’s body. It is illegal to catch, hold or throw the ball. A player cannot block or attack a serve from on or inside the 10-foot line. After the serve, front-line players may switch positions at the net. Matches are made up of sets; the number depends on level of play. 3-set matches are 2 sets to 25 points and a third set to 15. Each set must be won by two points. The winner is the first team to win 2 sets. 5-set matches are 4 sets to 25 points and fifth set to 15. The team must win by 2 unless tournament rules dictate otherwise. The winner is the first team to win three sets. When serving, the player steps on or across the service line as while making contact with the ball. Touching the net with any part of the body while the ball is in play. When blocking a ball coming from the opponent’s court, it’s illegal to contact the ball when reaching over the net if both your opponent has not used 3 contacts AND they have a player there to make a play on the ball. When attacking a ball coming from the opponent’s court, contacting the ball when reaching over the net is a violation if the ball has not yet broken the vertical plane of the net. Crossing the court centerline with any part of your body is a violation. Exception: if it is the hand or foot. In this case, the entire hand or entire foot must cross for it to be a violation. Back-row player blocking (deflecting a ball coming from the opponent) when, at the moment of contact, the back-row player is near the net and has part of his/her body above the top of the net. This is an illegal block. Back-row player attacking a ball inside the front zone (the area inside the 3M/10-foot line) when, at the moment of contact, the ball is completely above the net. This is an illegal attack. 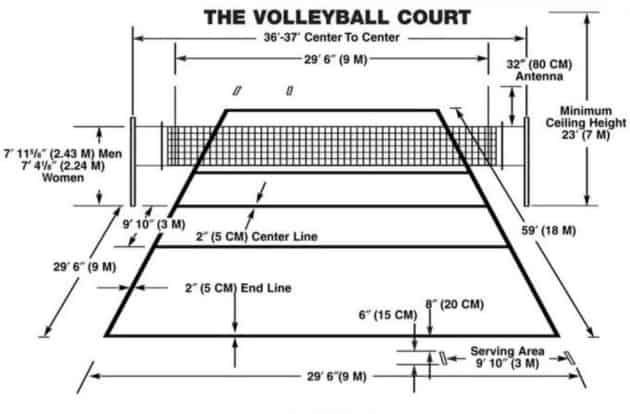 The court diagram shows the official volleyball indoor specifications. The official indoor court dimension is 9 meters by 18 meters with an attack line 3 meters from the center line. Ace: A serve that results directly in a point, usually when the ball hits the floor untouched on the receiving team’s side of the court. Assist: Helping a teammate set up for a kill. Attack: The offensive action of hitting the ball. Attacker: Also “hitter” and “spiker.” A player who attempts to hit a ball offensively with the purpose of terminating play. Attack Block: The defensive team’s attempt to block a spiked ball. Attack Error: An attack botched in one of 5 ways: ball lands out of bounds; ball goes into net; attacker commits center line or net violation or attacker illegally contacts ball. Attack Line: A line 3 meters/10 feet away from, and parallel to, the net. Separates the front-row players from the back-row players. A back-row player cannot legally attack the ball above the net unless he takes off from behind this line. Back Row Attack: When a back-row player takes off from behind the attack line (10-foot/3-meter) line and attacks the ball. Various terms A-B-C-D-PIPE-BIC. Back set: Set delivered behind the setter. Block: One of the 6 basic skills. A defensive play by one or more front-row players meant to intercept a spiked ball. The combination of one, 2 or 3 players jumping in front of the opposing spiker and contacting the spiked ball with the hands. Blocking Error: Touching the net, crossing the centerline, blocking a set or serve or any other “local” violation that occurs while making a block attempt. Center line: The boundary that runs under the net and divides the court into two equal halves. Closing the block: The responsibility of the assisting blocker(s) to angle their body relative to the first blocker. “Cover”: Refers to the hitter having his/her teammates ready to retrieve rebounds from the opposing blockers. Cross-court attack: An attack directed diagonally from the point of attack. Also called an angle hit. Cut shot: A spike from the hitter’s strong side that travels at a sharp angle across the net. Deep: Refers to sending the ball away from the net, toward the baseline of the opponent’s court. Defense: One of the 6 basic skills. The key skills used to receive the opponent's attack are digging and sprawling. The dig resembles a forearm pass from a low ready position and is used more for balls that are hit near the defender. The sprawl is a result of an attempted dig for a ball hit farther away from the defender. It resembles a dive. Dig: Passing a spiked or rapidly hit ball and low to ground. Defensive play. Slang for retrieving an attacked ball close to the floor. Statistically scored on a 3.0 point system. Dink: A one-handed, soft hit into the opponent’s court using the fingertips. Also called a tip. Double block: Two players working in unison to intercept a ball at the net. Double hit: Violation. Two successive hits by the same player. Down Ball: Type of attack. “Down” refers to the blockers who neither jump, nor raise their hands above the net. Dump: Usually performed by the setter, who delivers the ball into the opponent’s court on the second contact. Five-One (5-1): An offensive system that uses five hitters and one setter. Floater: A serve with no spin so the ball follows an erratic path. Follow: To move with and block an attacker. Athletes may change positions with another blocker in the process. Forearm Pass: Sometimes referred to as the “pass,” “bump” or “dig”. Four-Two (4-2): An offensive system using four hitters and two setters. Free ball: Returning the ball to the opponent without the intent to get a kill. Usually a slow, arcing pass or “roll” shot rather than a spike. Front: Position of a blocker so that she/he can block the attacker. Front-row: Three players whose court position is in front of the attack line (3M/10 Foot), near the net. These players are in positions 2, 3 & 4 on the court. Game plan: Offensive and defensive emphasis for an opponent. Usually organized for each rotation by the coaching staff. Held ball: A ball that comes to rest during contact resulting in a violation. Hit: One of the 6 basic skills. To jump and strike the ball with an overhand, forceful shot. Hitter: Also “spiker” or “attacker.” The player who is responsible for hitting the ball. Hitting percentage: A statistic derived from total kills minus total attack errors, divided by total attempts. Joust: When 2 opposing players contact the ball simultaneously above the net causing the ball to momentarily come to rest; the point is replayed if this is called by the official. Jump serve: The server uses an approach, toss, takeoff and serves the ball with a spiking motion while in the air. There are two main types: jump float, jump spin. Key player/play : To discern a team’s best player or probable next play by observation of patterns or habits. Kill: An attack that results directly in a point or sideout. Libero: A player specialized in defensive skills. This player must wear a contrasting jersey color from his or her teammates and cannot block or attack the ball when it is entirely above net height. When the ball is not in play, the libero can replace any back-row player without prior notice to the officials. Lines: The marks that serve as boundaries of a court. 2 inches (5cm) wide. Linesman: Officials located at the corners of the court; each linesman is responsible for ruling if the ball is legally in play along the lines for which he or she is responsible. For indicating touches and play outside of the antennae on their side of net. Lineup: Players starting rotation and, therefore, serving order. Numbered 1,2,3,4,5,6. Line serve: A straight-ahead serve landing near the opponent’s left sideline. Line shot: A ball spiked along an opponent’s sideline, closest to the hitter and outside the block. Load: Body position for the blockers so that they are most effective. Middle back: A defensive system that uses the middle back player in 6 to cover deep spikes. Also called “6 back” defense. Middle blocker: Usually plays in the middle of the net when in the front row and moves laterally to her blocking assignments. Mintonette: The original name of the game of volleyball, created by William Morgan. Men – 7 feet, 11-5/8 inches high (2.43m). Off-blocker: Outside blocker not included in the double block. Also called off-side blocker. Off-Speed Shots: An attack that is intentionally slow. Ball spiked with less than maximum force but with spin. Also called “roll” shot. Opposite: Player who plays opposite the setter in the rotation. In some systems, this player is also a setter. In other systems, this player is called a right-side. Outside hitter: Usually plays at the ends of the net when in the front row. Also called right-side (opposite) or left side (power). Overhand pass: A pass with both hands open that is controlled by the fingers, with the face below the ball. Both hands simultaneously contact the ball above the head and direct it to the intended target. Overhand serve: Serving the ball and striking it with the hand above the shoulder. Float or spin. Overlap: A violation called if a team is lined up out of rotation when the ball is served. Overpass: A ball passed across the net. Overset: An errant set that crosses the net without being touched by another offensive player. Pass: One of the 6 basic skills. Receiving a serve or the first contact of the ball with the intent to control the ball to another player. Also called a “bump”. Pancake: One-hand floor defensive technique where the hand is extended and slid along the floor palm down while the player dives or extension rolls so the ball bounces off the back of the hand and is considered legal. Party ball: When the ball is passed across the net in front of attack line so the front-row attacker can immediately hit the ball on the first contact. Penetration: The blocker’s ability to reach over the net above the opponent’s court. Perimeter: Backcourt defense where 4 players arrange themselves near the boundaries of the court. Pipe: A back-row attack from the middle of the court. Position 6. Play: An attack with a planned fake, usually including 2 or more hitter. Quick set: An extremely low vertical set used to beat the opponent’s block. Can be set at any position on the net. Rally scoring: Scoring method where points can be won by the serving or receiving team. Ready position: The flexed, yet comfortable, posture a player assumes before moving to the point of contact. Red card: Given by the official to a player or coach for flagrant misconduct resulting in a point/side out to the opponent. Results in automatic ejection and a point/side out for the opponent. Roof: To block a spike, usually straight down for a point. Rotation: The clockwise movement of players around the court and through the serving position following a side out. Players must retain their initial rotational order throughout the entire game, but once the ball is contacted on serve they are allowed to move anywhere. Seam: The mid-point between 2 players. Serve: One of the 6 basic skills. Used to put the ball into play. It is the only skill controlled exclusively by one player. Set: One of the 6 basic skills. The tactical skill in which a ball is directed to a point where a player can spike it into the opponent’s court. Sets can be set at different heights and different locations on the net and offensively there are names for each of these. First number is location on net and second number height of set. (Example: 13.) Sets can also be named. Set attack: When a setter attempts to score rather than set the ball to a setter. Also called a shoot set. Setter: The second passer whose job it is to position a pass to the hitter. serving team, or when the serving team commits an unforced error. Six-pack: Being hit in the face with the ball. Six-two (6-2): An offense with four spikers and two spiker/setters. Setter comes from the back row. Slide/step: A quick attack behind the setter. Spike: Also called a hit or attack. A ball contacted with force by a player on the offensive team who intends to terminate the ball on the opponent’s floor or off the opponent’s blocker. Split block: A double-block that leaves a space between the blockers. Stuff: A ball deflected back to the attacking team’s floor by the opponent’s blockers. Substitution: Allows one player to replace another player already on the court. Rules dictate number of subs each team is allowed. Switch: To change court positions after a ball is served to facilitate strongest player positions. Tandem: A combination in which one player attacks immediately behind another. Tape: The top of the net. Telegraph: To show one’s intention to the opponents. Tip: A one-handed, soft hit into the opponent’s court using the fingertips. Also called a dink. Tool: When an attacker hits the ball off an opposing blocker’s arms out of bounds. Also called a wipe. Touch: A player contacting the ball on the defensive play. Transition: To switch from offense to defense and vice versa. Triple-block: Block formed by all 3 front-row players. Underhand serve: A serve performed with an underhand striking action. The ball is usually contacted with the heel of the hand. W serve-receive formation: Three players in the front row, two in the back. Wipe: To deliberately spike the ball off an opponent’s hands and out of bounds. Also called a tool. Yellow Card: Given by the official to a player or coach as a warning of misconduct. Two yellow cards result in an automatic red card.